Two years ago, on 26 March 2015, the Saudi-led coalition started aerial attacks on Yemen, transforming a civil war into an international conflict with the predictable result: humanitarian disaster, intensification of the fighting, a far higher casualty toll, no exit strategy, much nonsense in international political circles and the media. Officially there are now some 40,000 human casualties, including more than 2,500 children and 1,900 women killed directly by the strikes. In addition thousands of women and children have died from lack of access to medical facilities and treatment. UNICEF estimates that a child dies every ten minutes from disease or hunger. Men also die, and not just in the fighting. A summary for those whose attention may be distracted by other disasters. The 2011 uprisings led to the formal departure of Saleh from the presidency he had held for 33 years, and restricted him to his role as head of the General People’s Congress, his political party. He was replaced by his former Vice President Hadi to head a 2-year transition through the Gulf Cooperation Council (GCC) Agreement mechanism and with the support of the United Nations. Between 2012 and 2014 while the formal transition moves were taking place (a failed security sector reform, National Dialogue Conference, constitutional committee, government of national unity), the Huthi movement, based in the far north of the country allied with its former enemy Saleh and took control of areas beyond its own stronghold. When the transition unravelled in 2014, this alliance moved further south, took over the capital and eventually ousted the transitional regime. Hadi, after a brief stop-over in the newly appointed temporary capital of Aden, took refuge in Saudi Arabia when the air strikes started and the war was internationalised. You may have read or heard about the famine which is threatening Yemen and countries in Africa. In some areas of Yemen people are already dying from starvation. First people can’t afford to buy food, even if prices had not risen as they have. Government staff are not paid, private sector employment is almost non-existent, and foreign funded development projects reduced to a bare skeleton of their pre-war situation. In some areas of Yemen people are already dying from starvation. The United Nations has stated that, of the four famines predicted for 2017, Yemen is the worst, with seven million people close to starvation and a further ten million in urgent need. It appeals for USD 2.1 billion for humanitarian work in Yemen this year. At a time of reduced international funding, this amount is unlikely to materialise. Last year’s appeal received 60% of the USD 1.6 billion requested. Translated into plain English this means people of all ages, including thousands of children, will be left to starve or die of disease, without water or having to walk miles to collect dirty water from wells or springs. The 2 million or more displaced families have nothing, no shelter, no food, no sanitation, nothing. Meanwhile in the UK, the DEC Yemen appeal launched last December, has collected more than 20 million pounds, but is now superseded by the new appeal for East Africa. Readers are urged to contribute anything they can to MSF, UNICEF, DEC or whichever is their favoured organisation operating in Yemen. The Saudi-led coalition air forces have carried out over 90,000 sorties over Yemen, and there is no prospect of them ending. Many sorties involve aircraft each dropping two 2000lb bombs. Precision targeting, assisted by US and British advisers in Saudi operations rooms has had mixed results: four Medecins Sans Frontières and another 270 medical facilities have been bombed, close to 750 schools, more than 500 markets and shops damaged or destroyed, let alone the damage to the country’s cultural heritage, with historic mosques, archaeological sites and museums attacked. There are plenty more figures, including the destruction of more than 400,000 homes: just think what this means for the families who lived there! Precision targeting, assisted by US and British advisers in Saudi operations rooms has had mixed results. Two years on, the short air-borne war which the newly appointed Saudi Minister of Defence probably hoped would seal his position as future king, has reached quagmire: most fronts have been more or less static for 18 months or more. The widely broadcast success of the current offensive along the Red Sea coast is proving more limited and more expensive than claimed. It is also accompanied by the usual ‘mistakes’, for example on 17 March a helicopter and sea attack killed more than 40 Somali refugees on their way to Sudan with UNHCR assistance. The coalition tactic of blaming the enemy fell flat, as the Saleh Huthi alliance has not one single aircraft of any description able to fly. Temporary capital Aden, the north-east area round Mareb, and most of the southern governorates (area of the former People’s Democratic Republic of Yemen) were liberated from Saleh-Huthi control in the summer of 2015. These areas have not experienced re-establishment of effective administration by the Hadi administration. For the first year, most ministers made occasional brief forays into Aden and even briefer stop-overs elsewhere. The one positive feature in the southern rural areas is that coalition airstrikes are rare. Instead, until January 2017, the people there had to expect US drone attacks against al Qaeda at any time. With the Trump Presidency, they have found that drone strikes are far more frequent and, in addition, US air strikes have become a regular feature. The now notorious Yakla ground attack in al Baidha governorate may be a foretaste of what is to come. Al Baidha deserves special mention as it is a front with ground fighting, coalition air strikes and US direct strikes. It is still largely controlled by the Huthi-Saleh alliance; resistance against Saleh’s forces is an alliance of local tribes with jihadis, so the people of that governorate get the worst of all worlds! Taiz city is another complex situation where all factions are present, but air strikes are rare. The coalition boasts advances on the ground, while their demands can be summarised as complete surrender by their opponents. 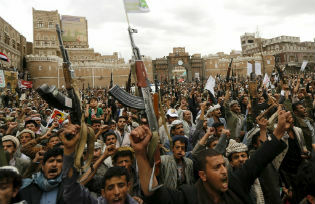 The Huthi-Saleh alliance remains militarily strong and don’t appear to be running out of weapons or ammunition. Their evident shortage of cash is alleviated by a taxation system which levies cash from citizens anywhere and everywhere as many times as possible along the routes of food supplies and anything else. This success of the Saudi public relations machinery is a rare achievement for the millions of dollars spent with western PR firms. While Trump decides whether Al Qaeda, Daesh or Iran is its prime target, whichever it chooses leaves Yemen in the firing line: although Daesh is barely present, propaganda about deep Iranian involvement has trumped the reality of little more than propaganda support, while the presence of famous Al Qaeda leaders in remote locations provide great targets. History analyses longer than tweets are probably of little interest to a US president whose concern is limited for the lives of human beings who are not Christian fundamentalists. It would be ridiculous to expect his administration to devote funds and time on famine relief, wider humanitarian needs or good governance at the expense of good relations with GCC millionaire monarchs. Making America Great again includes increased military budget and more arms sales. Since the conflict began, the US and UK have together transferred more than US$5 billion worth of arms to Saudi Arabia, more than 10 times the US$450 million that the US State Department and the UK’s Department for International Development have spent or budgeted for aid to Yemen. While boasting of being one of the largest aid and relief ‘donors’ to Yemen, with just over Sterling 130 million last year, that same year Britain agreed weapons sales worth USD 3.3 billion to Saudi Arabia. It has been demonstrated that some of the cluster bombs dropped in civilian areas were of British manufacture. Under pressure, the Saudis stopped using British cluster bombs and promptly replaced them with Brazilian ones, rather than giving up weapons which are known to kill and maim civilians and children decades after being dropped (see Laos, Cambodia for example). Opposition to British arms sales has led to a judicial review of their legality, whose findings are awaited. In addition there has been increasing discomfort in Parliament and beyond. While these are likely to lead to somewhat greater public attention and possibly to ensuring that more than half the British population know about the war, the May government is unlikely to stop weapons sales to allies expected to save the British economy from Brexit-related recession. Yemenis are actively being starved first by their own warmonger leaders, and second by the foreign states which feed this war with weapons and ammunition and allow the blockade of food and fuel. In conclusion, as we enter the third year of this awful war, the only new feature is the impending faminewhich is likely to kill thousands, possibly hundreds of thousands. Yemenis are not starving, they are actively being starved first by their own warmonger leaders, and second by the foreign states which feed this war with weapons and ammunition and allow the blockade of food and fuel. Prospects for peace are nowhere in sight. No serious pressure is being put on the internationally recognised government and its coalition partners to compromise while the other side has enough military capacity to continue indefinitely. Local smugglers of weapons, food and fuel are laughing all the way to their cash stores while international arms dealers are counting their profits. The Yemeni people have justifiably lost what little confidence they ever had in their leaders who, yet again, prove daily that they haven’t got an ounce of humanity in their souls. Eventually one can only hope that ordinary Yemeni men, women and children, will succeed in imposing their voices and views, and overcome the nightmarish obstacles in their path to peace and reasonable living conditions. Meanwhile let us all try and bring this day forward. For details see my earlier pieces in openDemocracy. See Amnesty International (23 March 2017) Yemen: Multibillion-dollar arms sales by USA and UK reveal shameful contradiction with aid efforts.